Please note the menu for my other products located on the upper left hand side of this page. 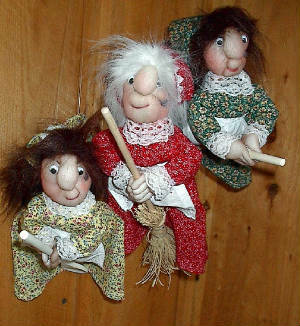 Depending where you do your research on the legend or folklore of KITCHEN WITCHES, some materials may tell you KITCHEN WITCHES ARE of German descent, while other might say they are a Norwegian custom handed down from generation to generation. The one thing we can be sure of is that the KITCHEN WITCH is from European decent. KITCHEN WITCH folklore tells us the kitchen witch is a good witch, making the kitchen a warm, cozy, and comfortable place to be in. She is a gentle, whimsical, loving creature, performing wonderful magic that out tricks the bad witch, who is full of mischief . Therefore, the bad witch looses her power to foil and ruin your cooking. According to ledgend, cakes, breads, and other pastries will rise according to recipes. Milk will not sour or spoil. Cooking pots won't boil over. Toast, potatoes, and rice won't burn. Spices you mix will be perfect, as well as the tea and coffee you serve. Whatever the ledgend, KITCHEN WITCHES really do make you laugh, so I guess the comfort part is right.
" KEEP SCROLLING THERE'S MORE TO SEE "
EACH KITCHEN WITCH IS A HAND CRAFTED ORIGINAL DESIGN, SO NO TWO WILL LOOK ALIKE. YOU CHOOSE HER FLYING OBJECT FROM EITHER A BROOM, A MOP, OR A SPOON. 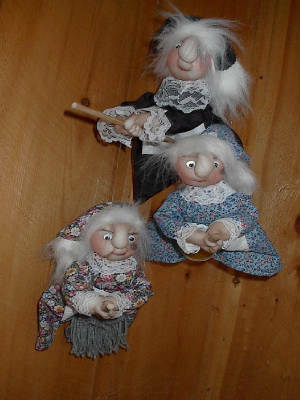 EACH KITCHEN WITCH IS DESIGNED TO HANG FROM A CEILING, AND THEY GIVE AN ILLUSION THAT THEY ARE LITERALLY FLYING ABOUT. COMPLETE INSTRUCTIONS FOR HANGING AND CARE OF THE KITCHEN WITCH IS INCLUDED WITH EACH ORDER. ALSO ATTACHED TO EACH OF THE RIDING OBJECTS THAT THE KITCHEN WITCH IS RIDING IS A TAG WITH A POEM ON IT THAT TELLS WHAT THE KITCHEN WITCH'S DUTIES ARE. SMALL SIZE KITCHEN WITCH IS ABOUT 12 INCHES LONG INCLUDING THE RIDING OBJECT. 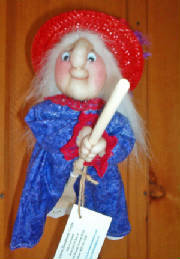 LARGE SIZE KITCHEN WITCH IS ABOUT 14 INCHES LONG INCLUDING THE RIDING OBJECT. PLUS $12 FOR SHIPPING AND TAX. The entire fee must be sent before the item will be made or mailed.....NO Exceptions.....If Payment is not received within 10 days of order placed, the order will automatically be cancelled. Because each Kitchen Witch order are made to order, there are NO refunds. Orders accepted for USA addresses only. There will be a $35 fee for any personal checks returned because of INSUFFICIENT FUNDS, or CLOSED ACCUNTS. FAILURE TO CORRECT A BAD CHECK WILL RESULT IN CRIMINAL PROSECUTION. PLEASE NOTE THAT I MAKE THE ENTIRE PRODUCT YOU SEE IN ALL OF THE PICTURES ON THIS SITE; THAT INCLUDES THEIR BODIES, WIGS, CLOTHES THEY WEAR, INCLUDING MOST ALL OF THEIR RIDING OBJECTS. I ONLY BUY THE SPOONS BECAUSE HAND MAKING THE SPOONS IS THE ONLY THING I HAVEN'T QUITE MASTERED YET. RE-DRESSING FEE FOR THIS SERVICE IS $22.95 PER WITCH PLUS $12 SHIPPING AND TAX FOR TOTAL OF $34.95. TOTAL PAYMENT MUST ACCOMPANY ORDER. Menu is located above on every page on this site. ThERE IS MORE TO SEE! DO YOU HAVE A SPECIAL EVENT COMING UP? PLEASE CONTACT ME AT LEAST TWO WEEKS PRIOR TO THE EVENT SO YOU CAN RECEIVE YOUR PURCHASE IN TIME. ALL CHRISTMAS ORDERS MUST BE PLACED BY DECEMBER 15th AND PAID FOR BY DECEMBER 20th IN ORDER TO BE RECEIVED FOR CHRISTMAS DELIVERY. "KEEP SCROLLING. YOU'RE ALMOST THERE FOR THIS PAGE..."
CALICO COLORS AVAILABLE ARE BLUE, RED, YELLOW, GREEN, OR BLACK CALICO. EACH REGULAR KITCHEN WITCH WEARS A WHITE APRON AND A MATCHING SCARF ON HER HEAD, AND CAN BE CO-ORDINATED WITH THE BAG HOLDERS COLORS. FEEL FREE TO INQUIRE IF OTHER COLORS MAY BE AVAILABLE. To get an idea of what the fabrics look like, please look at the pictures on this page and throughout the website that displays samples of some finished products. WHITE, BLACK, BROWN, RED (carrot color), BLONDE, or GREY color. "Keep scrolling, you're almost there. Don't forget to check out the other pages on this site."